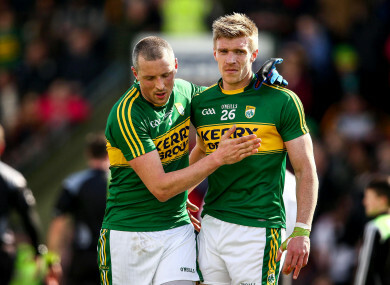 Kieran Donaghy and Tommy Walsh after a 2016 league game for Kerry against Cork. IT’S JUST OVER a decade since Kieran Donaghy and Tommy Walsh began working in tandem to wreak havoc on opposition defences as part of a Kerry attacking twin threat. They dovetailed successfully en route to Kerry’s 2008 All-Ireland final appearance before the following year Walsh cut loose and picked off 0-4 in a Sam Maguire triumph over Cork. Then Walsh pursued another new sporting avenue as he decamped to Australia before returning to Kerry colours for the start of the 2015 campaign after his AFL career had concluded. His involvement was short-lived as he departed the squad before the 2016 championship commenced but the career of the Kerins O’Rahilly’s player took another turn in the off season with the news that he was part of the plans of new boss Peter Keane. And Donaghy has backed his former attacking partner to make an impact, albeit he envisages a slight change of role. “I absolutely see him playing a part for Kerry this year. It’s great to have him back because I felt in ’15, when I was in there against Dublin late on, on a wet day, he could have been a fella that could have been thrown in and I think that kind of stung him a bit. “He was kind of gone after that so it’s good to see him back. He’s only 30 years of age. I got to 35 out of it. He definitely has a good few years to offer Kerry yet. “When me and him were playing together, I was the kind of big awkward target man and he was in the corner against a small corner-back, running out winning ball, pushing him aside and kicking it over the bar or going through on goal. “I see him nearly being that more kind of a target man in my eyes because you’ve got David (Clifford) and Paul Geaney and James O’Donoghue. You’ve enough of these fellas that can play, he can also go out centre-forward and be a kind of an aerial threat from kickouts or whatever. Kieran Donaghy at the launch of the Comórtas Peile Páidí Ó Sé 2019. “The injury he had, where the tendons come off the bone, it’s a horrific injury, so I would say that blistering pace out in front and getting it and turning and burning four fellas would be something that might have to change. “But he’s still a very good lead guy. He learned that out in Australia how to get out in front and he’s so big and strong that once he gets out in front of you, he’ll win it. The addition of another figure to the Kerry setup also enthuses Donaghy as he prepares to watch on for his first campaign since retiring. Donie Buckley has been a coveted figure after his recent coaching work with Mayo and has now returned to his native county. “I would say that Donie will be doing a lot on the team’s defence, work-rate, tackling, all that sort of stuff. It’s exciting definitely to have him back in with the new management. “I liked Donie and the way he goes to other sports. Whether it be rugby or American football or basketball, he’s always looking for little nuances you can take from games to try to implement in our game. “Donie has certainly been one who has done an awful lot of that. He’ll bring a freshness and a new approach. Email “'He definitely has a good few years to offer Kerry yet' - Walsh's return to the Kingdom cause”. Feedback on “'He definitely has a good few years to offer Kerry yet' - Walsh's return to the Kingdom cause”.